Kris Letterman is our Double Bluff park steward who keeps the poop bags stocked for us. Please make sure to thank her for stepping up to do this when you see her. Thanks to our friends at the Double Bluff Beach Club, who let us link to their webcam, you can now check out what conditions look like at Double Bluff. Go here to see the beach. Running along the base of steep Double Bluff, the Double Bluff Beach Off-Leash Area is a two-mile-long stretch of salt water beach on Useless Bay. At the base of the bluffs, enormous tangles of driftwood make great doggy jungle gyms. When the tide is out, the beach is hundreds of feet wide but even at high tide, the beach is wide enough for dogs to run themselves to a state of blissful exhaustion. For humans, Double Bluff offers stunning views of Mt Rainier, the Seattle skyline, the Olympic Peninsula and the shipping lanes. Soaring Bald Eagles and Great Blue Herons wading at the edge of the surf can be seen frequently. Grey whales put in an occasional appearance, too, especially in the Spring. Double Bluff Beach offers a grassy picnic area, viewing benches, rest rooms, doggie poop bags and a rinse station - which ensures that most of the sand stays at the beach and doesn't end up in your car. A dog-height drinking fountain is also available. 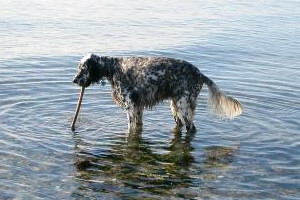 Please note: Immediately adjacent to the parking lot is an area designated for public use where people can enjoy the beach without encountering off-leash dogs. The off-leash area begins about 500 feet from the parking lot - the boundary is marked by a windsock on a flagpole. Dogs MUST be leashed on the walk from the parking lot to the beginning of the off-leash area. The county leash-law is in effect until you reach the off-leash area, and violators are subject to a $500 fine. 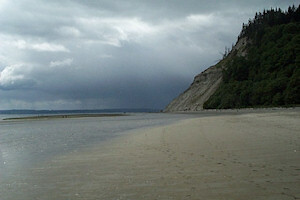 Double Bluff Beach opened in June, 1999 and continues to be a great success. In this multi-use area, please respect the off-leash boundaries and please pick up after your dogs! How to get there: From SR 525 head south on Double Bluff Road until the road dead ends at the beach.